This has been an exciting year at Fisk University Galleries. 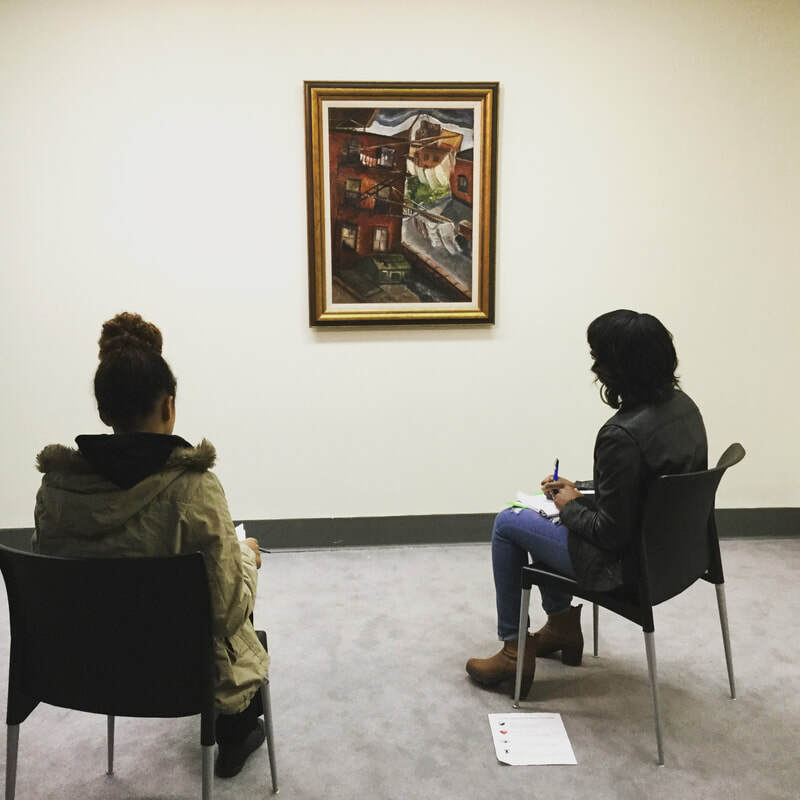 In April 2016 we celebrated the grand reopening of The Carl Van Vechten Gallery following a million dollar renovation; in less than a year we have developed a Fisk University Galleries Fellowship Program, established a Gallery Ambassador Program, created a Babies in the Gallery Program for 0-12 month olds, and launched the STEAM Series. We envision the gallery as an interdisciplinary learning laboratory for innovation powered by Fisk University students. Working closely with art, physics, computer science, and social science faculty, we are endeavoring to integrate the gallery into all academic disciplines. Some of our most important achievements in this first year are due to the strong emphasis we have placed on the development of STEAM programs. We attribute much of our success to being open to collaborative dialogue with faculty and students - we encourage faculty from different disciplines to approach the same body of material and explore the possibilities of object-based learning and students to engage with art from the vantage point of their academic and personal interests. Fisk is a natural fit for STEAM. It is a 151-year-old HBCU (Historically Black College and University) with 800 students, located in Nashville, TN. It is best known to incoming students as a great place to start a career in the STEM fields. Fisk has won four R&D 100 awards; it collaborates with NASA and Oak Ridge Laboratories, and individual chemistry and biology professors bring in multi-million dollar grants annually to fund their laboratory research. Fisk has an excellent rocketry team and produces a remarkable number of MDs and STEM PhDs. Fisk works to get children into STEM subjects early with community outreach programs like the THRUST eight week-long summer science camp for 5th-12th-graders. STEM is at the core of what Fisk does well. Fisk is also known for its impressive art collections and strong cultural heritage. Our 4,000-object permanent collection includes the Alfred Stieglitz Collection of Modern Art donated to us in 1949 by Georgia O’Keeffe, who not only curated this teaching collection for Fisk students during the era of segregation but also stayed on campus and worked closely with students. The gallery’s first director was Pearl Creswell, an African-American woman gallery director who served in the role for over four decades. Her 83-year old daughter Dr. Carol Creswell volunteers in the gallery three days a week. In addition to the Stieglitz Collection we have received gifts from Abby Aldrich Rockefeller, the Harmon Foundation, and Aaron Douglas, the founding chair of our Art Department, to name a few. Our collection is particularly strong in African Art and 20th-century African-American Art, especially by artists associated with the Harlem Renaissance, the Works Progress Administration, and the Civil Rights era, up to the 1980s. 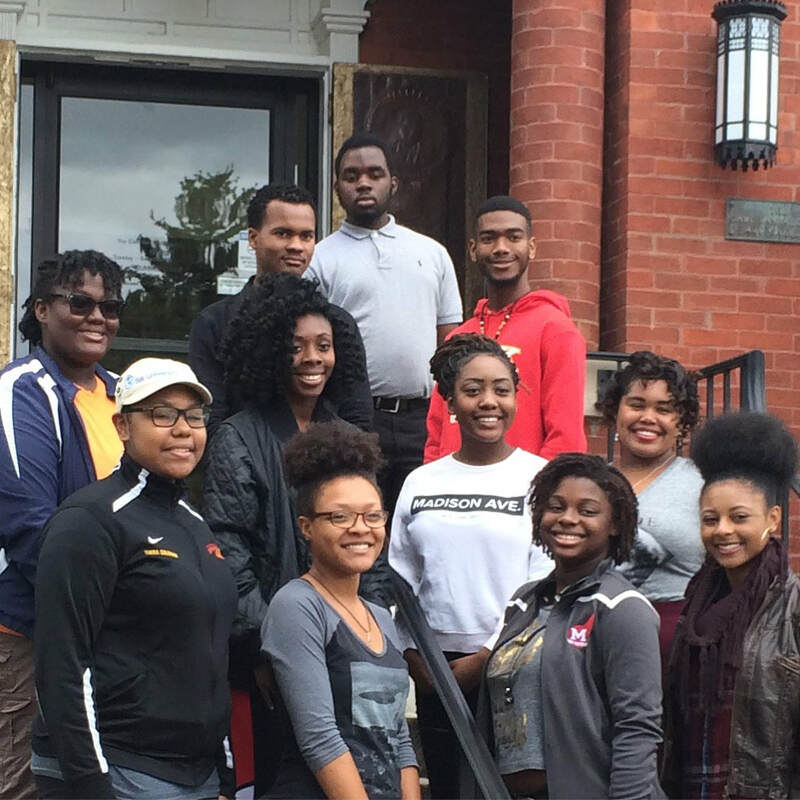 Gallery Ambassadors on the steps of the Carl Van Vechten Gallery, Fisk University. ​The majority of the Fisk students working with the collection are STEM majors. 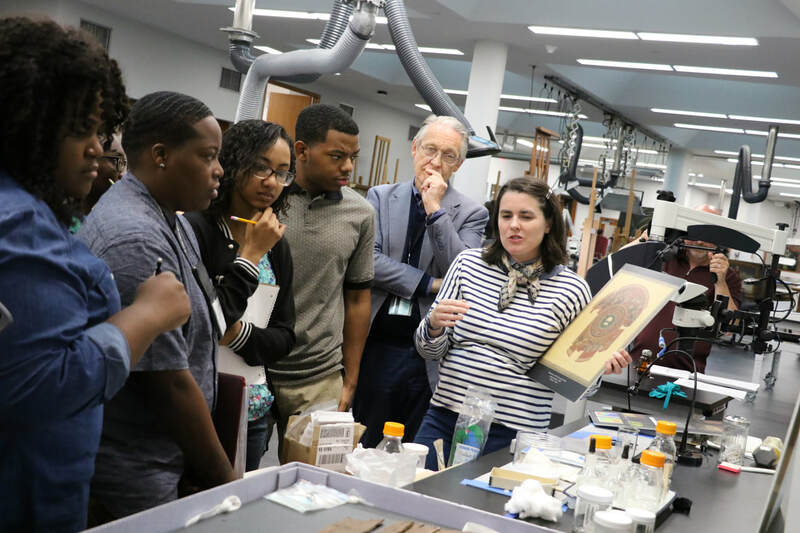 These are the students that give tours, conduct research in the galleries, assist with class visits and pulling artwork, and are learning about the condition and conservation of artwork. 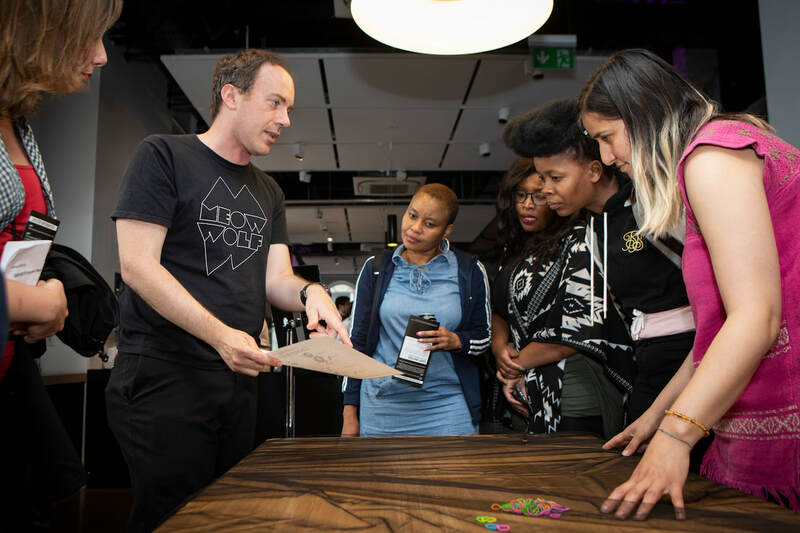 The students’ STEM backgrounds make them think differently about how they might stay involved with art as they progress in their academic careers and life after graduation. One of our students aims to become a medical illustrator and another, a biology-turned-music-business major, is passionate about the preservation of photographs. We train our students in critical thinking, but we also emphasize thinking in an interdisciplinary way. Biology Professor Phyllis Freeman recommends all of her pre-dental students and aspiring surgeons take sculpture. ​Two programs within the physics department grew out of casual conversations with the head of rocketry, Kent Wallace, and the chair of the department, Arnold Burger. With Kent Wallace we created the STEAM Series—unorthodox gallery talks from the perspective of a physicist. In these talks that are open to students, faculty, and the community, he focuses on how art has inspired scientists and mathematicians to pursue various questions and he uses the museum and gallery space as a pedagogical opportunity to conduct informal learning in scientific literacy. He is comfortable talking about art, but in discussing outdoor photography he talks about the position of the sunlight as astronomy and when analyzing a landscape he focuses the audience’s attention on the dimensions of the Cartesian coordinate system. Wallace’s STEAM Series has drawn STEM faculty into the gallery, including some that have been teaching at Fisk for years and had not yet been inside the gallery. Upcoming talks will focus on light, pointillism and the universe, and ancient cultures and astronomy. Another physicist, the department chair Arnold Burger, is a specialist in crystal growth; he and the Gallery Director have devised an “Under the Microscope” competition for the 2018 annual Spring Arts Festival and Research Symposium in which his physics students will submit their photographs of crystal growth to be judged by a panel of scientists and art specialists, who will evaluate the works based on scientific and aesthetic qualities. Two of Katharine Burnett’s American Literature students working on IPOP captions for Malvin Gray Johnson’s Pulley Lines in the Aaron Douglas Gallery. ​In collaboration with computer science professor Sajid Husain we have been exploring the possibility of having students develop an algorithm using security camera footage to analyze which pieces are most popular with visitors, which works they are drawn to first, and how long they stand in front of given works. With these findings we will be poised to align the curatorial vision with behavior patterns. Professor Husain and his students are also working with us on a kiosk project to illuminate art objects and cultural heritage sites on campus using iPads, but that is only for the first iteration. The larger vision is to have STEM students and humanities students work together to activate campus heritage sites using increasingly sophisticated technological means such as virtual reality. Kent Wallace’s STEAM Series: “Dimensions” in the Carl Van Vechten Gallery. In addition to our physics and computer science collaborations, we are working with the behavioral and social sciences to enhance the visitor experience. We have invited students in Professor Leslie Collins’s Experimental Research Design class to design surveys for the gallery to learn about our culturally and socioeconomically diverse visitors. In addition, we have been working with English Professor Katharine Burnett and her students on a caption writing project on works by Malvin Gray Johnson; we are using the IPOP theory of experience preference developed by Andrew Pekarik at the Smithsonian Office of Policy and Analysis. IPOP stands for Ideas-People-Objects-Physical; it has been shown to predict a visitor’s first two stops with 85% accuracy. Ian McClure and Paul Messier presenting on working in the field of cultural heritage preservation, Carl Van Vechten Gallery. ​As a STEAM-focused HBCU gallery it is important to introduce our students to conservation. The Mellon Foundation Art Museum Demographic Survey from 2015 showed that 4% of art museum curators, conservators, educators, and leaders are black. One of our many guest lectures this year was by Yale conservators Ian McClure and Paul Messier; they shared their experiences innovating at the intersection of art and science in the field of fine art conservation and cultural preservation. Following their lecture we have been actively helping our students pursue summer opportunities in conservation at Yale, Winterthur, and beyond. This summer Fisk University Galleries Director-Curator Jamaal Sheats, a Fisk student, and a recent graduate participated in a week-long intensive conservation training program, the Summer Teachers Institute for Technical Art History (STITAH) at Yale’s Institute for the Preservation of Cultural Heritage in partnership with the HBCU Alliance of Museums and Art Galleries; the training was made possible by Ian McClure, Paul Messier, Caryl MacFarland, and Jontyle Robinson with support from the Kress Foundation. The student and recent graduate continued to train at Winterthur/the University of Delaware for two more weeks, immediately applying their knowledge to actual conservation projects. Conservation suits the interests of our Gallery Ambassadors, who are majority STEM majors. Our hope is that our students who do conservation internships share their learning with the Fisk community and continue to pursue conservation. 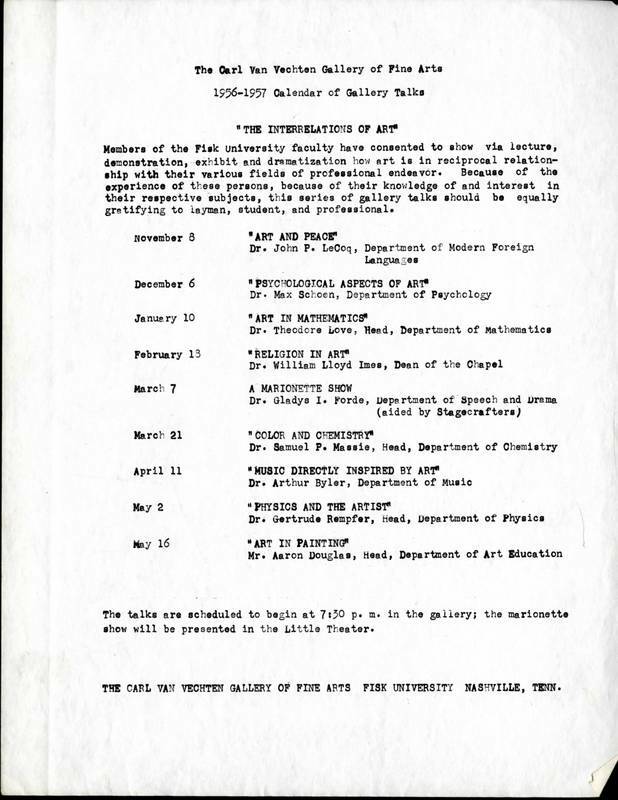 ​We would like to conclude with a list of gallery talks from 1956 that we found in our archives, which serves as a reminder that what we now call STEAM was alive and well at Fisk University Galleries over half a century ago. The events include “Art in Mathematics” with the head of the math department, “Color and Chemistry” with the head of the chemistry department, “Physics and the Artist” with the head of the physics department, who, by the way, was a woman and a pioneer in electron microscopy. You will notice that Aaron Douglas did the last in the series. We are proud to reinvigorate STEAM at Fisk. Through the Fisk-Vanderbilt Bridge Program, Fisk helps produce 3-4 minority STEM PhDs a year. The University’s joint pre-med program with Meharry Medical College, an HBCU Medical School, also aids in the graduating of many successful African-American physicians. Fisk has a pre-dental program with Tufts Dental School and Dual Engineering degree programs with Case Western, Vanderbilt, and the University of Tennessee, Knoxville. 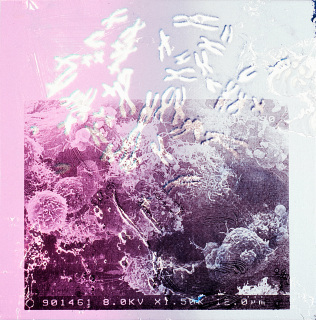 Their science backgrounds inspire them to approach the materiality of objects with great curiosity, for example, the chemistry behind photographic processes, the oxidation of paper, and how paint can fade over time. Andrew J. Pekarik, James B. Schreiber, Nadine Hanemann, Kelly Richmond, and Barbara Mogel, IPOP: A Theory of Experience Preference, Vol. 57 no. 1 (January 2014). Short introduction to IPOP available here: https://www.si.edu/Content/opanda/docs/IPOP/IPOP%20short%20description%20150806.pdf. http://www.conservators-converse.org/wp-content/uploads/2016/05/Screen-Shot-2016-05-25-at-10.12.08-PM.png. 84% white, 6% Asian, 3% two or more races, 3% white (Hispanic), 0% American Indian, 0% Native Hawaiian. Nikoo Paydar is Assistant Curator at Fisk University Galleries and a lecturer in the Art Department. She holds a PhD from the Courtauld Institute of Art, University of London, and a BA from Tufts University; she also studied at the School of Oriental and African Studies (SOAS), University of London. She co-founded and co-directed Iranian Alliances Across Borders (IAAB), a nonprofit organization focused on Iranian diaspora youth now in its 14th year. Jamaal B. Sheats, MFA, is the Director and Curator of the Fisk University Galleries and Assistant Professor in the Fisk University Art Department. Sheats has simultaneously maintained a strong and consistent exhibition record for nearly 15 years in galleries across the nation and abroad. Sheats is the owner of Sheats Repoussé and the Charlotte Art Project, and continues to receive accolades for his work. He has been featured in the Boston Globe, New York Times, Numbers, and Nashville Arts Magazine. He holds positions on the Frist Center for the Arts Education Council and the “To Share a Legacy” HBCU Alliance and is a board member of the Arts and Business Council and the Association of Academic Museums and Galleries.